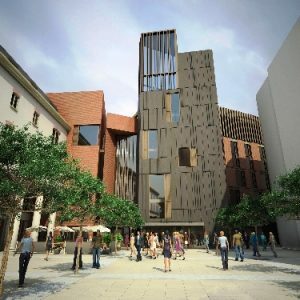 Work has officially started on the construction of Metropolitan Arts Centre in Cathedral Quarter. The MAC will be Northern Ireland’s flagship home for all the arts (visual art, theatre, dance, music and comedy) when it opens in early 2012. The 60,000 sq ft building, costing £17.7m will house two theatres, three visual art galleries, dance studios, rehearsal rooms, offices and a bar/restaurant. “Northern Ireland is a creative place with a huge reservoir of industrial, business and artistic talent. Apart from being a place of culture and entertainment the MAC will help position the arts here as a job-generating industry by providing a centre of excellence which can help people get on the first rung of a career in the creative industries”.